Going Out In My Mailbag: 1 Item! 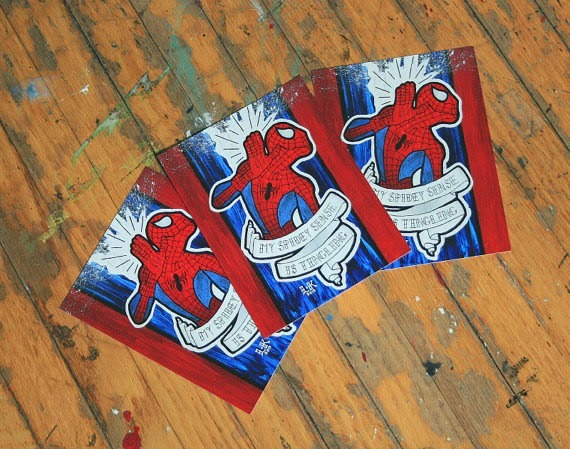 Item #1: Spiderman/Geeky Postcard for Fellow Geek Patricia! (sorry for the stock photo - the picture I took was done in a hurry and is super blurry) I'm not even completely sure whether or not Patricia is a superhero/Marvel geek, but I suppose I shall eventually find out. Anyway, like I said in the post where I received the awesome Jane Austen postcard she sent, I asked her whether or not she, like me, was a die hard fan of Emma Approved as well as The Lizzie Bennet Diaries. I really hope she is; I could always use a new person to gush over episodes with! One of the things that I have absolutely loved about joining the IGGPPC and joining Postcrossing and getting on Twitter and getting to meet all of these amazing people is the connections that I have been able to forge in the process. I have met such amazing people since I started all of this last year and there is not one person that I have encountered since becoming an iggle that I regret meeting. As I get closer and closer to the 1 year mark of when things really began to change in my life for the better (and for the geekier XP), I'm able to see just how much better things have gotten since I began to make attempts to connect with like-minded people. I wish I could stress this point enough, but apparently there are situations where there aren't enough words to properly express my elation. 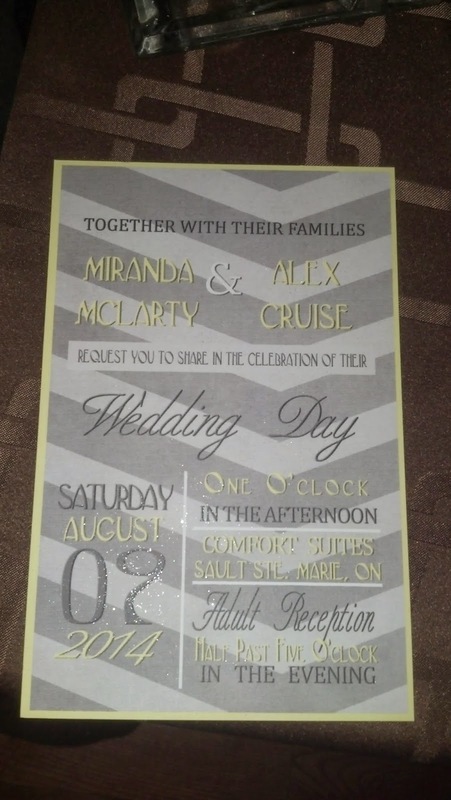 Item #1: Wedding Invitation From My Cousin Alex! I haven't had much of a chance to get to know Alex, along with his 3 brothers, because they and their parents live in Sault St. Marie, which is crazy far away from the Niagara region, to the point where I'm pretty sure there's a ferry involved in getting there. Even so, the few times I have seen my uncle Joey, like when there's a wedding here in Niagara, he's always been one of the funniest and most outgoing of my uncles, plus my aunt Judy is extremely nice. The only catch to the invite is neither me nor my mother was given a plus 1. I'm sure this is to avoid the chance for any sort of awkwardness surrounding the scenario in which my mom would bring her boyfriend Peter. Even so, it's completely understandable, and neither one of us is put out by it. Either way, I'm so grateful to my family for being able to invite both me and my mother to this event. Sure, it would have been nice to bring along my boyfriend so he could meet more of my family members (as well as having him for arm candy XD), but I completely understand the reasoning. That's it for now! I'll keep you guys posted.